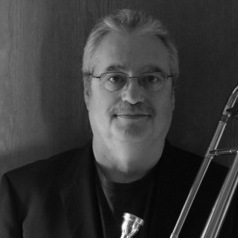 Mark Harding began his musical studies playing trombone duets with his dad. At the University of Calgary he managed to graduate in 1983 having earned a BSc in Computer Science with a minor in Music. While at U of C, Mark played in the University Jazz Lab with Ward Cole and later with John Reid. He also studied with Paul Hoelzley, Phil Brink, Douglas Hornberger, and Eric Friedenberg. Mark has played with the Calgary Philharmonic Orchestra, the Red Deer Symphony, and the Calgary Civic Symphony, and is a long time member of Altius Brass. He has played in many productions including with Rita MacNeil, Diana Krall, and with the New York cast of West Side Story. Mark is thrilled to be playing with Prime Time, and to have a chance to play again with so many old friends!